Home Page | Superior Seating, Inc.
Make it your own with contrasting stitching, piping, and specialty colors! 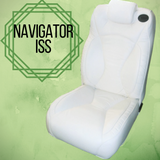 Superior Seating is proud to introduce our newest seat style, the Navigator ISS! With its elegant lines and Integrated Seat Belt system, the Navigator is perfect for your high-end limousine, RV, or Sprinter conversion. Choose from beautiful, rich colors and customize with comfort options like in-seat heating and cooling or massage. For more information, visit the Navigator's page by clicking the image, or call 866-389-9011. You can also email us at Ryan@superior-seats.com. Also, be sure to ask about our Heavy Duty Seat decks! These are available for most seat styles, and are especially recommended for those of our customers who spend long hours driving! 1. Select a style from our Seating Products page here. Choose standard seats for semi truck, pickup truck, or SUV seating that does not require a built-in seat belt. For shuttle, Sprinter, or Executive limousine seating, our ISS (Integrated Seat Belt Seats) are the perfect choice. 2. Choose your covering material here. 3. Choose your options here. Ride in perfect comfort with options like in-seat heating and cooling, massage, a second arm, or lumbar support. 4. Choose your base, if you need one, here. We offer a limited selection of air ride and stationery bases, as well as some adapter kits that allow our seat to bolt directly to your existing base. Our salespeople can help you decide if you need a new base, and which one is right for your vehicle. For help ordering your sofa, large limo pieces, or other products, please call or email our sales team. the industry leader in custom seating for trucks, vans, RVs, shuttles, and limousines. Our location in the heart of the recreational vehicle manufacturing industry in Elkhart, IN, means we have easy access to the best raw materials and talent in the business, and more than 47 years' experience ensures our furniture will truly deliver Superior comfort, Superior style, and Superior quality! Please be aware that because we create custom seats, built to order, WE DO NOT ACCEPT RETURNS FOR ANY REASON. If your seat is defective due to an error in workmanship or materials, please let us know, and we will make arrangements to fix it as soon as possible. Any attempt to fix the seat without contacting us will void your warranty. Also, please be aware that we at Superior Seating are not installers or converters. We create custom seats. The customer is completely responsible for the correct installation of the seating once it is received. If you need help installing, please let us know, and we can put you in contact with a qualified installation professional. Samples of all fabrics available upon request via USPS Priority Mail. Please allow 4-6 weeks after your order is placed for completion of your seat. Shipping is an additional 5-10 business days, depending upon your location. All orders are custom made and built with specific materials and options. For this reason we will accept no returns. All quoted prices are void after 45 days. Thank you for understanding.